I absolutely love working with mamas-to-be and this maternity session is one of my favorite experiences! There is something so powerful in carrying another human and watching it grow from the inside. Originally my friend (the couple’s cousin) and I went to just visit Miriam and Daniel and explore DC. However, after meeting this sweet couple who lives in Arlington and discovering she was almost 8 months pregnant, I had to ask. 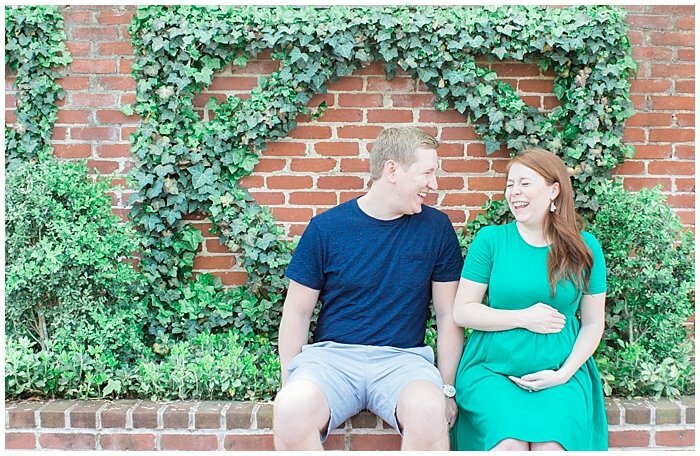 How about we do an adorable Arlington maternity session while I’m here?! Even though I had none of my equipment or was prepared, they had a feasible camera on hand. The next day we took a drive to historic downtown Arlington near the docks and it was the perfect photo location. We all really enjoyed strolling downtown on this beautiful Sunday in May. This session came as perfect timing since mama is getting to the uncomfortable, feeling way too fat, no pictures stage. Unfortunately, mama’s to be usually hate the way they look when they are pregnant. So if I can make them feel beautiful, then I’ve done my job! It is the most powerful creation to have life growing inside of you, there is no bigger gift. Exploring the water docks & historic neighborhoods made our time such fun. We just took it all in stride with no expectations and enjoyed this spontaneous session. We even stopped for the usual ice cream craving. It came as such a sweet blessing to Miriam seeing as her mother passed just recently. Even as her family was mourning she discovered she became pregnant. Sometimes, in the midst of great loss comes great blessing. I wish them so much joy with their new addition on its way. I know this sweet pair will make great parents and I look forward to meeting baby girl in the near future.